SAN FRANCISCO (Reuters) - Levi Strauss & Co posted an 8 percent gain in net income on Tuesday 9 February despite a slide in overall sales, helped by new stores that boosted gross margins and improvements in the Levi brand in the United States. The San Francisco-based private company, which discloses quarterly results due to its publicly held debt, sees sales growth in 2010, but anticipates lower operating margins due to recent investments. Results in the quarter benefited by an influx of new outlet stores as well as the strengthening U.S. dollar to currencies such as the Yen and the Euro. Fourth-quarter net income was $67 million compared with $62 million a year earlier. Revenue fell nearly 5 percent to $1.21 billion from $1.27 billion, the company said. Gross margins rose to 51.5 percent of revenues from 49.2 percent a year earlier. Earlier this summer, Levi Strauss acquired 73 Levi's and Docker's outlet stores from a former licensee. 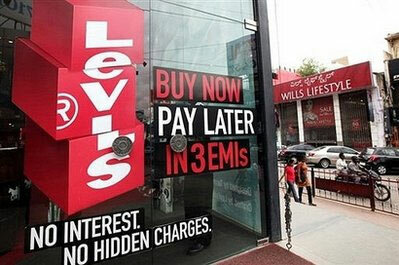 Moreover, the company has been adding to its fleet of full-price Levi's brand stores. The retail expansion has helped to counteract a pervading sales slump in mature markets such as the United States, Europe and Japan, where consumers have pared back purchases and department stores have cut back on inventory. Revenue fell 4.8 percent in the Americas region, which includes the United States, 12.8 percent in Europe and 3.2 percent in Asia, the company said. "We expect conditions to continue to be challenging in Europe," Chief Executive John Anderson said on a conference call with analysts, adding that wholesale customers continued to be conservative in the first quarter. Calling wholesale "the core of our business," Anderson cited improvements such as new vendor management programs, new fixtures and marketing efforts. The company recently picked up U.S. wholesale customers Dillard's Inc (DDS.N), J Crew Group Inc (JCG.N) and Urban Outfitters (URBN.O). But Wal-Mart Stores Inc (WMT.N), the largest U.S. retailer and a key Levi Strauss customer in recent years, has been cutting back on merchandise due to a new focus on grocery and electronics items instead of apparel. But Robert Hanson, president of Levi Strauss Americas said he was seeing "strong success" with the company's clothing at rival retailer Target Corp (TGT.N). Levi Strauss has been overhauling its Dockers khaki business, which has been in a slump, with a new "Wear the Pants" ad campaign and new fits to appeal to younger men. Net debt at the end of 2009 was $1.58 billion versus $1.64 billion a year earlier, a decrease of 3.7 percent. The company plans $166 million in capital expenditures in 2010, said Chief Financial Officer Blake Jorgensen, versus $83 million in 2009.